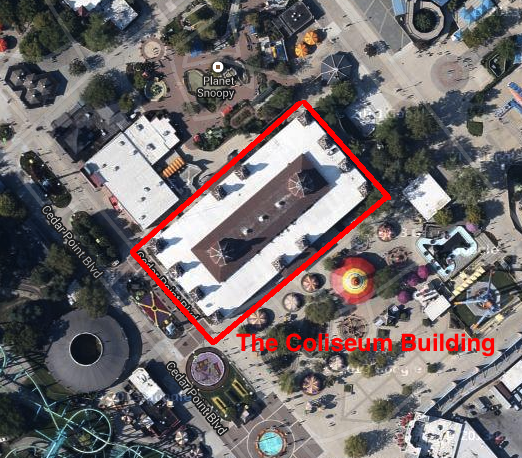 InSanity lurks Inside: Cedar Point Announcement for 2014- New 'Dark Ride' Attraction? Cedar Point Announcement for 2014- New 'Dark Ride' Attraction? Once again, Cedar Point is up to something. Rumors are flying left and right about a possible new "dark ride" style attraction being added to the park in 2014. The park is suppose to announce whatever this 2014 addition is on Tuesday, August 27th at an unknown time. Lately everyone has been gossiping about a dark ride, possibly going in above the arcade which is in the coliseum building. Located right on the main path through the beginning of the park, this is one of the biggest buildings left standing in the park today. One report found from Screamscape is "An innovative, interactive dark ride" which to me just screams another "shoot'em up" style dark ride, such as many parks are currently hosting. Another report also states the park was looking for a family to announce the new attraction, so it's likely going to be a family style ride. However, one has to wonder if this building will be enough space for something truly 'innovative"? It's unknown if the arcade will also leave and if it will take up both floors of the building or just the second story area. I know many parks of stuffed shooter style dark-rides into small spaces but that often limits the ability to theme an immerse environment, in my opinion. We'll have to wait and see what the park announces about this newest addition coming in 2014! InSanity lurks Inside will be reporting as more information becomes available!